Departement of Vaucluse - Pop. : 7,000 inh. Situated 5 km north-east of Carpentras via the D950, 18 km south-east of Orange via the D950 and 30 km north-east of Avignon. 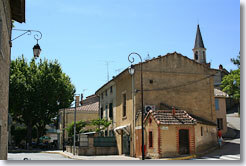 Loriol du Comtat is a peaceful little village just a stone's throw away from Carpentras and about 20 min from Avignon. 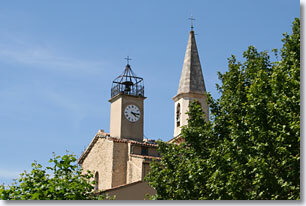 Loriol is located in an agricultural plain surrounded by vast vine fields that produce the famous Côtes du Rhône and Aoc Ventoux. 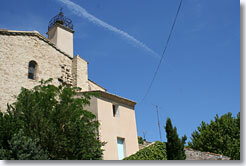 There are châteaux and beautiful residences spread through this lovely green countryside. As you get closer to the village you will notice a few more recently built detached houses on the outskirts. In the distance you will see the bell tower of the Romanesque church. The centre of the village is fairly small, so you can't miss the large terrace of the cafe opposite a pleasantly shaded little square. The Romanesque church is beautiful. 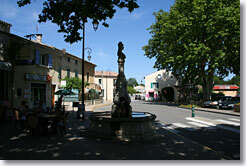 It simultaneously overlooks and is in the centre of the village. Go right up to its door and you will have a beautiful view of the plain surrounding Loriol. You will also be able to have a stroll in the gardens just below the village hall. Next to it, on the boulodrome, you will be able to watch the games of boules that bring together a few friends from the village... you may not understand all that is going on but it can be an enjoyable experience. You will hear a few phrases in Provencal, a few "galejades" (tall tales) and some local expressions... getting to know Provence from the inside.